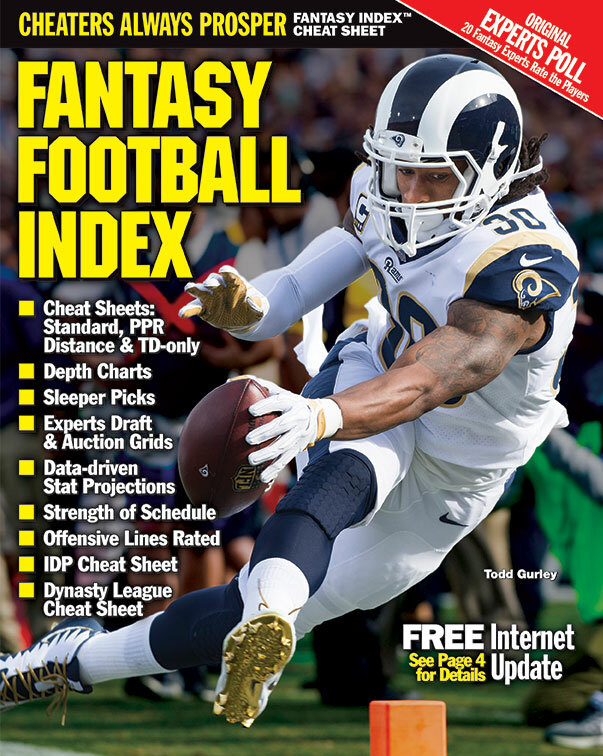 Fantasy Football Index publisher Ian Allan answers your questions about fantasy football. Click here to submit a question. Ian Allan answers your fantasy football questions. In this edition: Why James White is still an elite PPR running back. Identifying waiver-pickup defenses for the playoffs. Starting Lamar Jackson over Aaron Rodgers (maybe). And taking a flyer on Jake Kumerow. I don’t understand your latest rest of the season rankings. You have James White at 14 overall when I’d be surprised if he even is the top RB on his team. You’re looking at the PPR rankings. White catches a ton of passes, and those are pivotal in that format. White has been the 9th-highest scoring running back so far, with 30 more points than #10 and over 50 more than guys hovering around #11 (Phillip Lindsay, Joe Mixon). They’ve got Sony Michel back now, of course, but I don’t see that having a big impact on White’s role. Michel has gone over 100 total yards in four games this year, and White has averaged 19.5 PPR points in those games -- exactly what’s he’s also averaged in the other seven games. I have Joe Mixon, James White, Josh Adams, Lamar Miller and Matt Breida. I am getting concerned about James White’s production over the last two weeks. With Rex Burkhead’s return do you still feel like he is the 2nd-best back on my team. I am in a PPR league and need to start 3. Don’t think of White as a running back. He’s a third-down back – almost like a slot receiver. You’re playing for the receiving production. With PPR scoring, that style of play is richly rewarded. Compare him, for example, to Josh Adams. When Adams carried the ball 17 times for 80 yards, but with no receptions, that game is worth 8 points. When White runs for 10 yards and catching 5 balls for 40 yards, that seemingly harmless game is worth 10 points. White is very much entrenched in that role. I wouldn’t worry at all about the Patriots potentially using Burkhead some in that role – that’s not going to happen. The last few years I’ve decided to stream defenses from week to week with some success (thanks in large part to you!). That said, this year has been very different. Week 12: Jacksonville 0. Week 11; Carolina 2. Week 10: NY Jets 2. Week 9: Denver 8. Week 8: Arizona 8. Week 7: Arizona 6. Week 4: Seattle 4. Week 2: Baltimore 0. You’ve been nailing other positions for me though! I’m saying all this to motivate you to tighten up the defenses! LOL. I’m leading my league in scoring. I’m winning my division. Is there a defense that you could see putting up top-10 numbers in Weeks 14-16 that may be available now? As usual, you’re the best. Keep up the great work, my friend! You can look at the problem in various ways. You might want to assume that you’re not playing in Weeks 15-16 unless you win in Week 14, putting the priority on that matchup. Or you might figure that the goal isn’t to reach the title game, you’re trying to win it – putting the premium on the Week 16 game. If we just treat them as a three-game block, we put together a rough estimate of which defenses should be helped along by scheduling. Take the Week 14-16 opponents for each team, total up the sacks, interceptions and fumbles that have been allowed by those offenses, and it gives a glimpse at what defenses should perform better (or worse) than they’re playing right now. This doesn’t factor in the actual defense itself, of course, which is a huge part of the equation. So I think we need to look at defenses in the top 10 on this chart, but ones that bring a little something to the table anyway. Perhaps Lions, Broncos, Cowboys, Titans, Colts. I would guess one or two of those defenses might available. Pittsburgh and Carolina, by the way, have been pretty good defenses in there, but their opponents in there have allowed a league-low 1.9 sacks per game. On this chart “Points” shows the total of sacks, interceptions and lost fumbles (with the turnovers being worth 2 points). There’s more chance involved with touchdowns, so I left them out. TD-only league. I need to add two dynasty receivers. We keep 16 players so we are talking whoever will have the best career. Available are C. Samuel, K. Coutee, D. Westbrook, K. Bourne, E. St. Brown. I don’t see a lot of difference between these guys. Kendrick Bourne is the only one I wouldn’t consider at all. The 49ers have used him some around the goal line, I guess, but I’m not 100 percent confident he’ll be on their roster in 2019. Curtis Samuel was lost as a rookie, but he seems to be figuring things out. He’s scored 6 TDs in his last eight games. For most of this season, he hasn’t been one of their top 3 wide receivers in playing time, but he got to fill in for Devin Funchess last week and seemed to hold up fine. I’m thinking Samuel might start next year and be a decent receiver. I’d probably also give one of the spots to Dede Westbrook. I have no idea who’ll be the quarterback there next year or what kind of offense they’ll be running, but Westbrook should be a part of it – he’s flashed some ability. Typically with TD-only, you want to latch onto the good offenses. So maybe we should be thinking more about Equanimeous St. Brown. I’m expecting Randall Cobb will be gone, so St. Brown could be one of the three main wide receivers for the Packers next year, and I would think they’ll get Aaron Rodgers back on track, to where he’s throwing about 40 TDs. Each weekend I post an article on dynasty leagues, with rankings at one position (QB, RB, WR, TE). Wide receivers are coming up in the rotation this week. Thank you for your excellent work. I've followed your sage advice this season and am a combined 19-5 with the #1 seed secured last week in both of my leagues. Looking ahead to Week 15, I have Rodgers and don't feel good about starting him at Chicago. QBs on the waiver wire include Dak, Mariota, Lamar Jackson, Mayfield, Stafford, Josh Allen, Keenum and Stafford. Would you start any of those guys over Rodgers in Week 15? We only have a 3-man bench, so I'd need to drop Rodgers or one of my flex/WR2/RB2 guys – Lockett, DJ Moore, Josh Adams, Carson, Mack, or Edelman. I don’t want to start Rodgers in Week 15. The best you would get there, I think, would be average numbers. They’ll have pass protection problems, and the weather might be lousy. But you’ve got to have another viable option to plug in. I don’t know if you have that. Of the players you list, the one I would consider would be Lamar Jackson. Probably the league’s worst passer (among starters) right now, but he’s dynamite as a runner, and they’re at home against a hopelessly inept Tampa Bay defense. It’s a unit that in six road games has allowed 5, 6, 4, 4, 6 and 4 touchdowns. I don’t want to lock in on Jackson as a starter today. Let’s see how he plays against Atlanta and Kansas City. Is he even still starting in Week 15? But there’s a decent chance that I will strongly prefer Jackson over Rodgers when we get to Week 15. I would bring him in as a backup quarterback for now and see how things transpire. Any love for Jake Kumerow? Sounds like he may be back this Sunday or next. I remember him getting a lot of hype in the preseason, and it sure looks to me like Rodgers is struggling with all the inexperienced receivers out there - will probably really welcome a guy who's been in the system for a while. Does he jump in front of MVS and ESB and become fantasy-relevant for the last games of the season? He caught 52- and 82-yard touchdowns in the first two games of the preseason, and he’s been out since that time. He’s been down for three months. I would expect they’d work him in as a situational player – not one of their three main wide receivers, but a player who comes in for 5-10 plays a game, with a deep ball or two thrown his way. Not worth a fantasy roster spot, in my opinion. Is it time to jettison Landry? Ever since the Browns relieved themselves of Hue, he never gets any catches. Double-digit targets in 7 of first 8 weeks; less than 6 per over the last 3. Landry’s two 100-yard games came in the first three weeks, when Tyrod Taylor was starting. He’s averaged 44 yards in the eight games Baker Mayfield has started, with 2 TDs. They’re not using Landry in the slot-type role that he always filled in Miami, where he averaged 100 catches in his four seasons. Landry is too good to release, I think, but if you can avoid putting him in your starting lineup for now, that probably would be a good thing. Planning for week 15 since it looks like I will have a bye. With the limited options in my league at this point is Wash a D that can be serviceable? They’ve got Jacksonville that week, with Cody Kessler at quarterback. That’s an incredibly sack-friendly matchup. As a pro football quarterback (including preseason) Kessler has been sacked on over 15 percent of his pass plays. That’s probably the worst ratio in the league. He’s a guy who’ll hold it and take sacks. With Jacksonville missing their left tackle, center and high-priced guard, I consider Kessler to be the best sack-matchup quarterback in the league right now. By far. But at the same time, Kessler doesn’t throw interceptions. He threw only 19 interceptions in 41 starts at Southern Cal. You might complain that he was surrounded there by superior talent, but Kessler also threw only 2 interceptions in the eight games he started as a rookie on a bad Browns team. As a pro (again, including preseason) he’s averaged 61 pass attempts per interception. He’s got a weak arm, but he knows that, so he’s throwing almost exclusively short balls underneath – he’s not taking a lot of chances. When I rank the defenses for Week 15 (and this same logic applies for Tennessee in Week 14), they’ll be ranked in the top 10 for sacks but the bottom 10 for interceptions. Dynasty league question. My playoffs run from weeks 15-17. I am thinking of cutting Jack Doyle and adding Hunter Henry. I hear Hunter may be activated in December, which coincides with the playoff schedule. Plus I will have Henry for next season. On the downside if Hunter is not activated by week 15 I cannot make any more moves and will carry over a 0 at my TE spot. Thoughts? If we’re drafting for 2019, Henry would be one of the first 10 tight ends I would pick. Maybe top 5. But I don’t think you can count on him for anything this year. He tore his ACL on May 22 – just over six months ago. If he gets back for Week 15, that might be a record recover for an injury of that type. I will be very surprised if he appears in a regular-season game. And if he were to somehow pull that off, I imagine he’d be appearing in a very limited role, playing in combination with Antonio Gates and Virgil Green. If it were my franchise, I would submit a claim only if there were no other tight ends of meaningful value available on the waiver wire. I am very confused by your ROS rankings of Ingram over T.Y. Hilton week after. I traded Hilton for Ingram in PPR and it has cost me two wins already. To see you having Ingram over him really makes no sense. Hilton thus far has averaged 5 catches and 79 yards, with 6 TDs in nine games. That’s 16.9 per game in PPR scoring, and I’ve got him at 15.8 for the remaining five games. Ingram has averaged 82 yards (63 run, 19 rec) and 2 catches, with 5 TDs in seven games. That’s 14.4 in PPR scoring, and I’ve got him at 14.9 for the final five games. So on my stat sheet, I’ve got Hilton averaging a point more week than Ingram. When it comes to an overall ranking, running backs are harder to find than wide receivers in PPR. The baseline bar is set lower for running backs. So I have Ingram higher than Hilton on my board. Seems about right to me. The good news is that my team has won their division. Bad news, Need to replace Jimmy Graham. I am concerned only with weeks 15 and 16. From the list I copied from your re-drafter, who do you like for weeks 15 and 16 only: Mo Alie-Cox,/ Jonnu Smith, Tyler Higbee, Gerald Everett, Matt LaCosse, Nick Vannett. I’d be looking at Smith and LaCosse. Both play for teams that should benefit from easy schedules over the next month. Smith has been coming on, with 3 TDs in his last four games. (On the downside, he did absolutely nothing in the first seven games of the season.) The Broncos have used Jeff Heuerman a ton around the goal line – 8 pass attempts inside the 10. With Heuerman out, there’s some chance LaCosse will now fill that role. LaCosse scored on Sunday against the Steelers. I'm in a 10-team PPR and the playoff system is a one week cut down from this week till week 16. So one bad week and your done. I have to decide between Ekeler and Lindsay for my flex? Sounds like you have a lot of love for Lindsay. Now we can revisit a question I asked a few weeks back about starting two Ram WRs. I have to choose 3 out of Woods, Cooks, JuJu, Hilton, and Golladay? Definitely starting JuJu and Cooks after that I am leaning toward Woods this week. Hilton draws Ramsey and the Jags and I fear Golladay will be the focus of the defense. Help me Obi Wan you are my only hope. Lindsay in general should be your running back (I think). He’s got a string of choice matchups against bad defenses. Trouble is, it’s PPR scoring. Ekeler is a great pass catcher, and the Chargers really use their running backs in that capacity. They’re playing at Pittsburgh on Sunday night. If they struggle to run the ball in that game, Ekeler will be remarkably busy as a pass catcher. He caught 10 passes last week. I would likely start Lindsay this week, but let’s see how they play on Sunday before deciding on the Week 14 starter. For the wide receivers, it’s going to be really hard for you to pick the best three. All five of them are really good. Jalen Ramsey hasn’t practiced, and with him looking unlikely to play, Hilton might be your No. 1 guy. Rams supposedly are getting Aqib Talib back, putting their cornerback tandem back in place, but I can’t rule out Golladay. Los Angeles has allowed 18 TD passes to wide receivers, the most of any team in the league. I am really struggling with my defense. I pick up Cincinnati and started them for zero points this week. I see they play Oakland and Cleveland in weeks 15 and 16 but I am losing faith after this past week. On my waiver wire I have Panthers, Colts, Miami, Broncos and the Saints which one would you scope up? I put together a strength-of-schedule chart for defenses on another question. Broncos and Colts were two of the defenses that stood out. Bengals let you down last week. Perhaps they’ll pay you back by serving up a bunch of sacks and turnovers for the Broncos on Sunday. They’ve got a young quarterback starting his first game (though Driskel hasn’t been a disaster in his limited playing time this year – only 3 sacks and 1 turnover in 94 pass attempts including the preseason). I lost Dalton in my yearly league. I have Winston & Ryan going into the playoffs. Which backup would you take? I think that looks like a good enough one-two punch. I would roll with those two guys, picking a starter via matchups and performance each week.